This sends a strong message as to what safety means to the leadership of that company. What about on an individual level? Are people within the same company more or less safe than others? Research would suggest that this is absolutely the case. Exhibiting caution, as well as being aware of your surroundings are 2 traits that vary amongst the population. They are also tied to an individual’s SafetyDNATM and their likelihood to get into an accident. 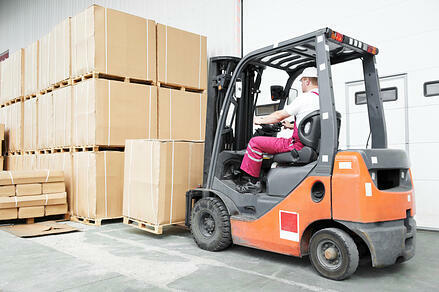 I had a call a few years back from a client needing forklift training (sound familiar?) The man mentioned he had only 1 week to get the training done. This sounded like it might be an abatement situation following an OSHA investigation. Unlike most of the calls involving OSHA visits, this was a response to an incident involving an injury. Apparently a worker was tasked with transporting a standard warehouse style, class IV, sit down counterbalance forklift from a repair shop in town to the company location 2 miles down the road. Rather than trailer the machine, the worker chose to drive it back to the company site (on a 55mph highway). He failed to take into consideration the natural crown of the highway and the makeup of the soft gravel shoulder when he pulled over to allow a car to pass him from behind. The forklift tipped almost instantly as it sank into the soft shoulder. This operator was not wearing the seatbelt which left him powerless from his own brain. In this fight or flight situation his brain reacted the way most would and he attempted to jump clear of the machine. It is the overhead guard that makes this nearly impossible, but you often realize that when it is too late. The driver was pinned under the machine for 45 minutes. He did survive, and was at the training I conducted as part of the abatement from the citations levied on the company. I am not sure how many of the 15 workers at that site would have chosen the same protocol if they were asked to return the forklift. With no procedure in place they were left with individuals making decisions on their own. That is a little scary when most people are not even aware of what they are not aware of. Hopefully more companies will continue to realize the importance of procedure and protocol rather than assume everyone will just come up with the safest way on their own. Understanding your own personal SafetyDNA can really give you an idea of what your awareness level and tendency to exhibit caution is. With this information individuals can start to learn ways to compensate for these traits. Then we just have to get them to start following the rules already in place. Wear your seatbelt! Our Guest Blogger this week is Terry Weston, CSP, CMSP who is a workplace safety consultant for South Central College. He has developed and delivered countless training sessions in the areas of OSHA and MSHA. He also presents at national conferences across the nation in the areas of training materials, delivery, and retention. Find him on LinkedIn.